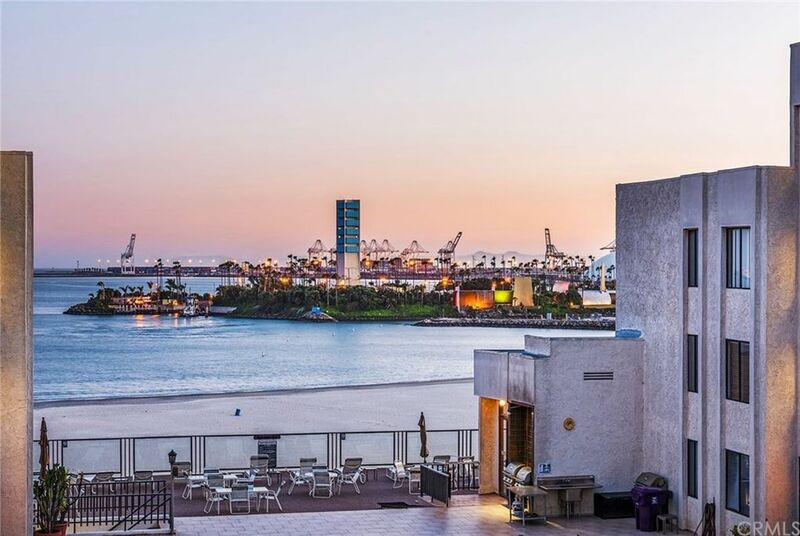 Beachfront lifestyle and affordable sophistication with knockout ocean, Catalina Island, coastline, Queen Mary and marina views. This is an impeccably renovated top-floor (Penthouse) unit in the highly demanded on the sand Queens View complex. This amazing home has stunning views and brings the sounds of the ocean indoors with a modern interior setting! The amazing interior upgrades create a stunning beach front paradise which begins with a beautifully remodeled open kitchen featuring stainless steel appliances, custom cherry wood cabinetry and granite counter tops with a full granite backsplash. Custom crown moldings and trim, plush carpet and custom tiled floors along with custom designer interior paint will be appreciated by the most discerning buyer. You will fall in love with the comforts of your highly upgraded bathroom including gorgeous custom cherry wood cabinetry, dual master sinks with granite counter tops and beautiful custom tiled flooring! There is a large master closet and other storage in unit plus extra assigned storage in the secured parking garage which maximizes your space needs. This fantastic home also offers a terrific built in office space with custom wood work creating the perfect ocean view work space! Your direct beach access, pool, spa, sundeck, sauna, gym, bike storage, low HOA dues, plus walking distance to the very best of Downtown is truly incomparable to anything at this price on the sand! This fantastic complex is FHA and VA approved! !